Happy New Year from the BullionStar team! 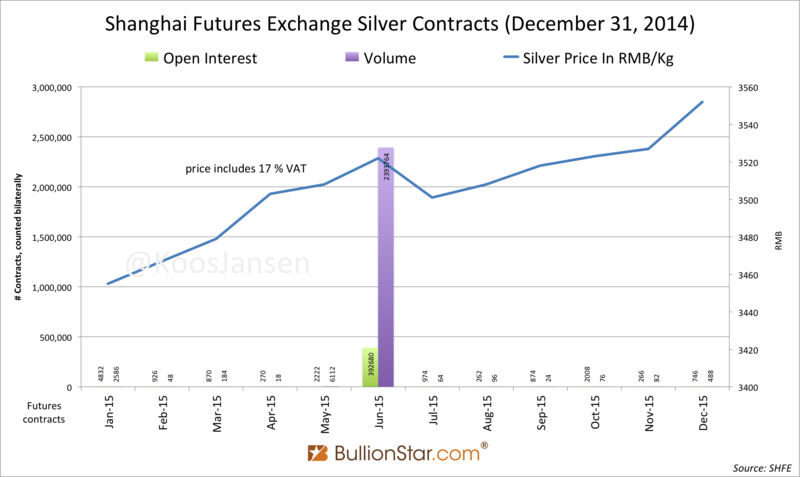 In 2014 silver futures traded on the Shanghai Futures Exchange (SHFE) accounted for 2,908,168 tonnes. 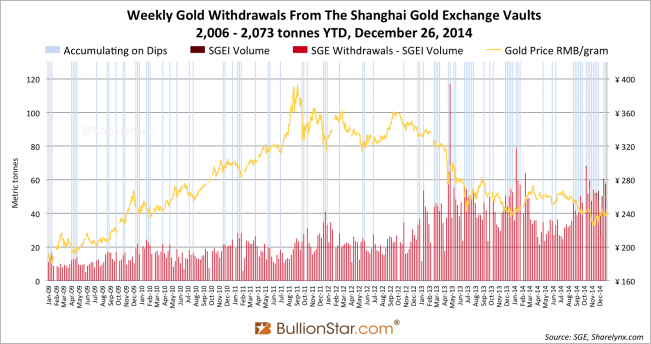 On the COMEX 2,123,387 tonnes were traded, 37 % less than in Shanghai. 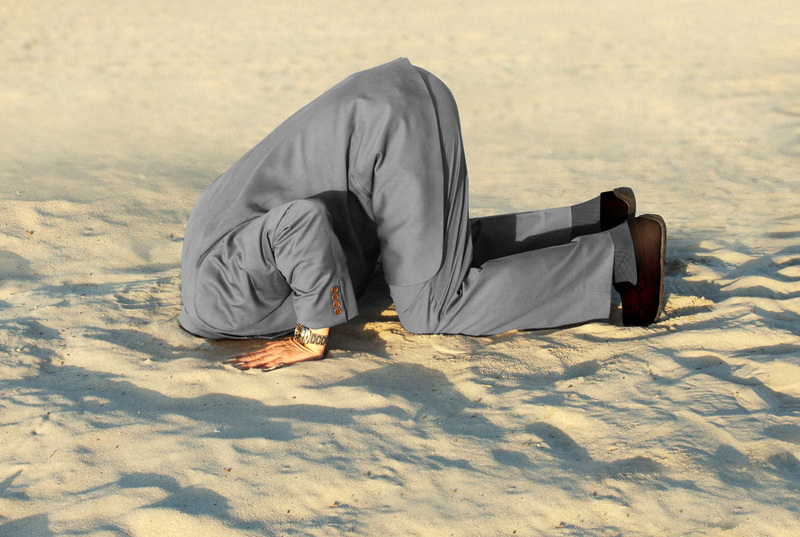 First let’s have a look at the latest SGE trade report of week 52 (December 22 -26). 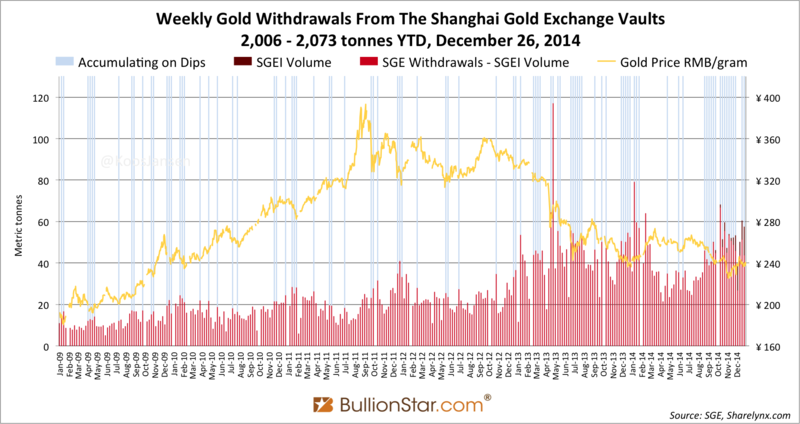 Total SGE gold withdrawals was a staggering 58 tonnes in week 52, year to date (until December 26) SGE withdrawals have reached 2,073 tonnes. 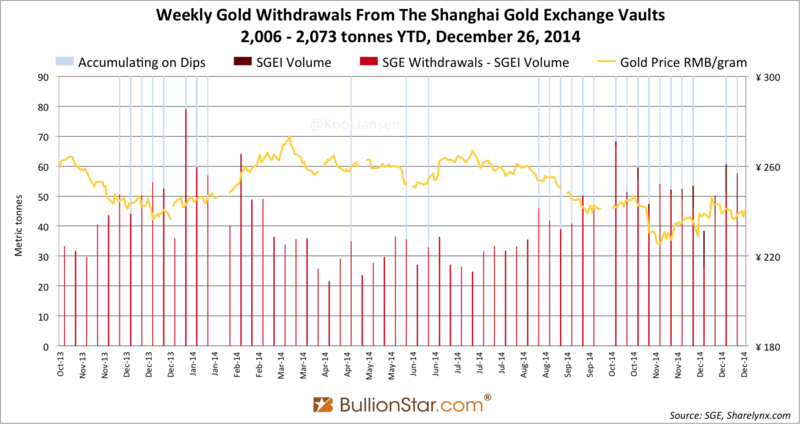 With three trading days left (December 29 – 31) total withdrawals are 124 tonnes shy of the 2013 record (2197 tonnes). 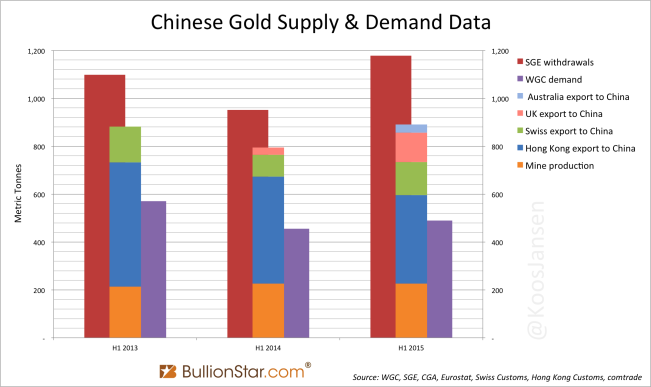 The possibility 2014 withdrawals will transcend 2013 is small, though 2014 has once again been an incredible strong year for Chinese gold demand. Regular readers of this blog are used to the tonnage being withdrawn from the SGE vaults every week, often more than 40 tonnes (in one week). 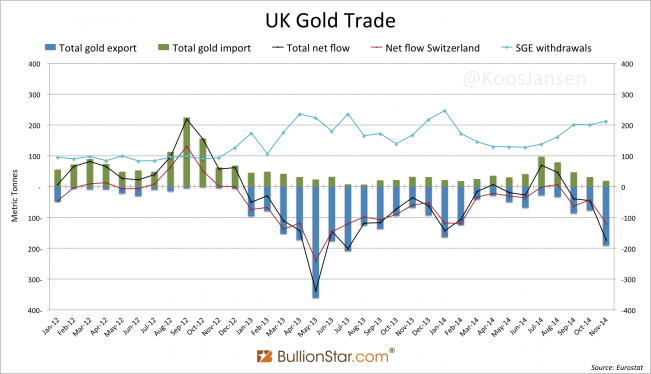 The fact the mainstream media, or the World Gold Council, CPM Group or Thomson Reuters GFMS, still don’t report these numbers is getting weirder by the day. 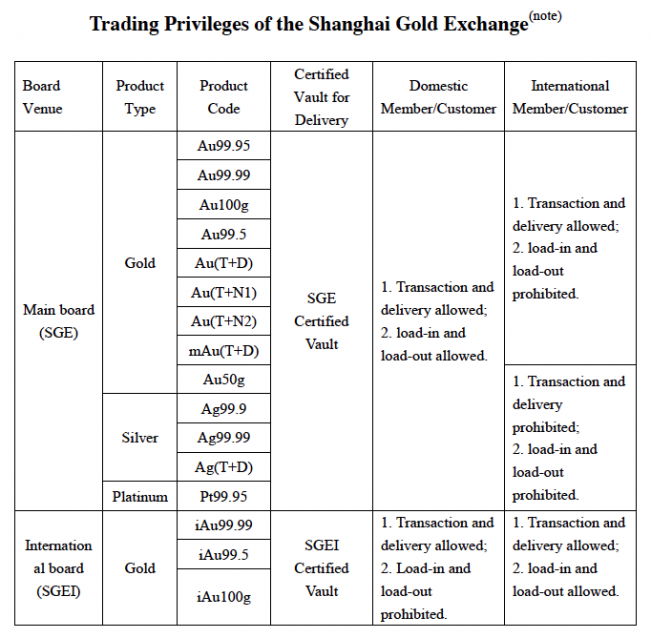 Because gold bullion export is prohibited in china, we know by tracking SGE withdrawals, fairly accurate, how much gold is being added to Chinese non-government gold reserves. 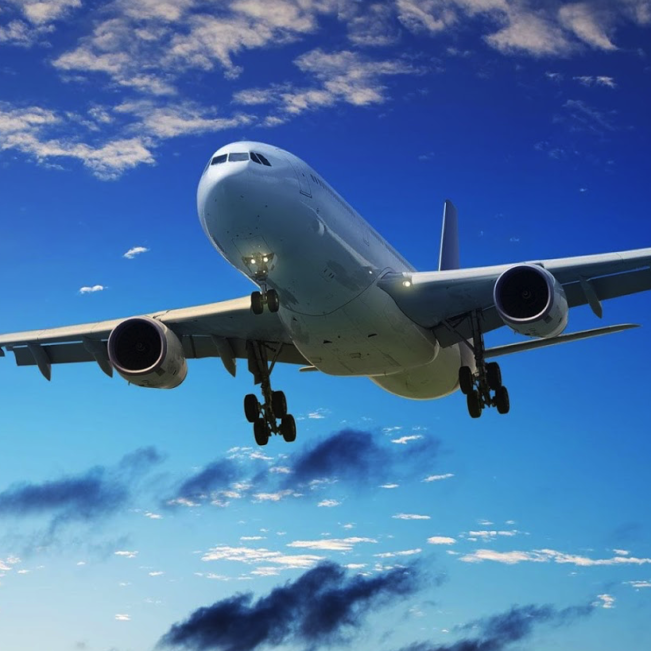 This year that amount will be about 1,700 tonnes. 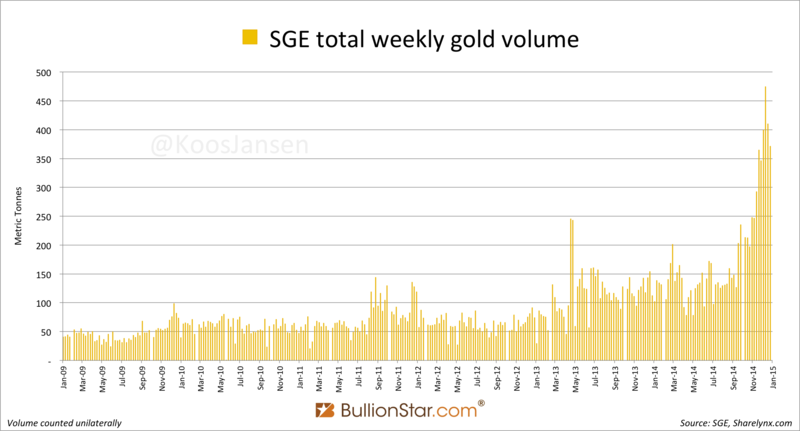 Some SGE data lags one week, some not; in this post all gold data is up to week 52 (December 26). Corrected by trading volume on the Shanghai International Gold Exchange (SGEI) – read this post for a comprehensive explanation of the relationship between SGEI trading volume and withdrawals – SGE withdrawals in the mainland, that equal Chinese wholesale demand, were at least 44 tonnes, at most 58 tonnes. Year to date SGE withdrawals in the mainland were at least 2,006 tonnes, at most 2,073 tonnes. Recycled gold through the SGE 350 tonnes. 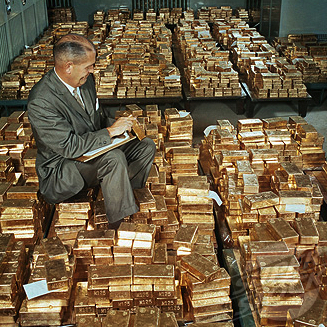 Let us have a look at size of the precious metals (paper) markets in China relative to the COMEX. 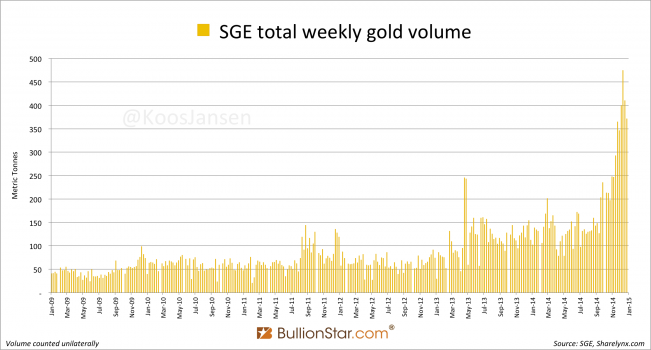 SGE gold trading volume saw a remarkable lift-off this year, most likely because 8 SGE contracts were allowed to be traded by foreign investors. Total volume traded in 2013 on the SGE was 5,807 tonnes (counted unilaterally). 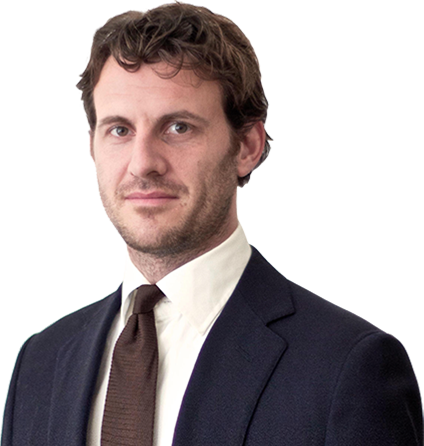 In 2014 volume has already surpassed 8,982 tonnes; an amplification of at least 55 % y/y. Total volume traded in week 52 was 371 tonnes, down 10 % w/w. 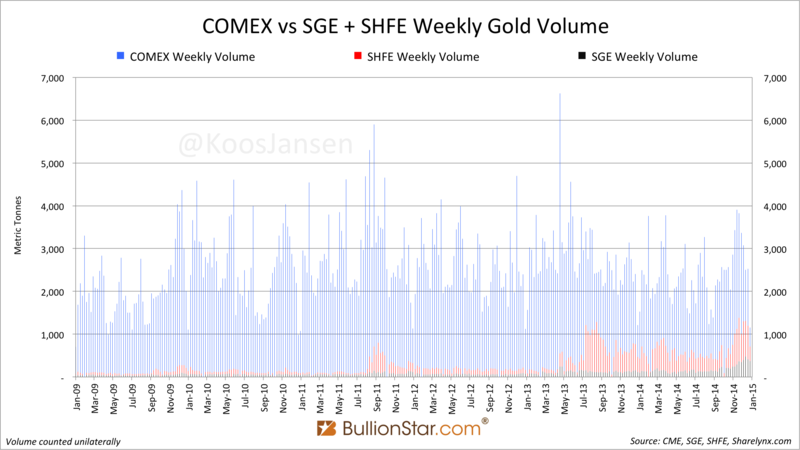 Volume on the two largest gold futures exchanges on earth (COMEX and the SHFE) have been low in week 52. 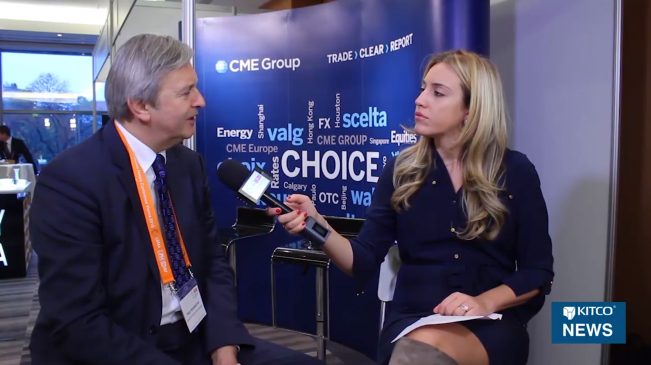 On the Shanghai Futures Exchange (SHFE) volume in week 52 dropped 56 % w/w, to 344 tonnes. 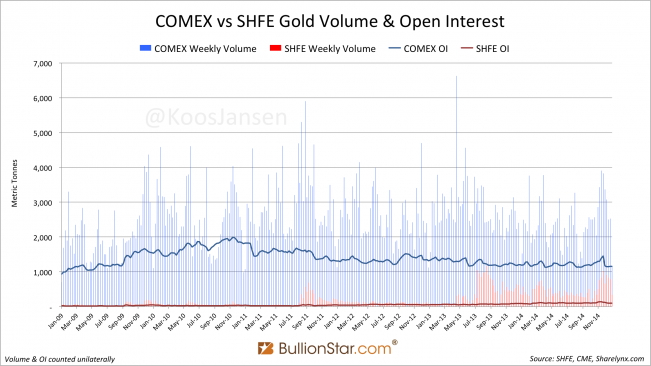 On the COMEX weekly volume dropped 54 % w/w, to 1,152 tonnes (the COMEX trading week counted only four days). 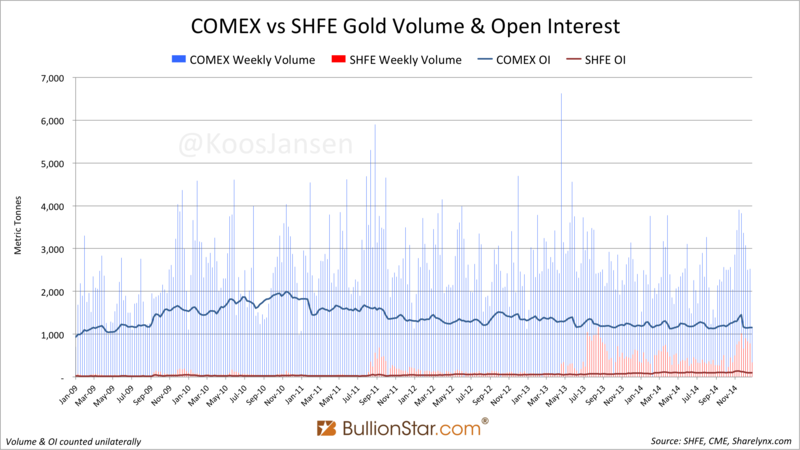 The Open Interest (OI) on the SHFE closed December 26 at 101 tonnes, on the COMEX at 1,158 tonnes. The total OI on the SGE of all gold deferred contracts combined – Au(T+D), mAu(T+D), Au(T+N1) and Au(T+N2) – stood at 109 tonnes on December 26. 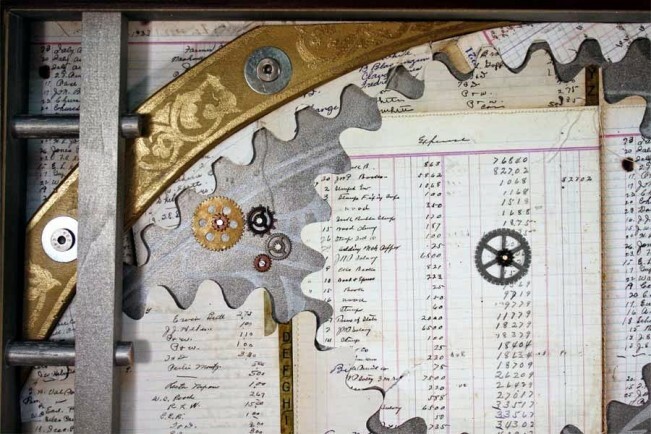 Let’s have a look in the silver pit. For silver we have all the data of all exchanges (SGE, SHFE, COMEX) for 2014 complete. 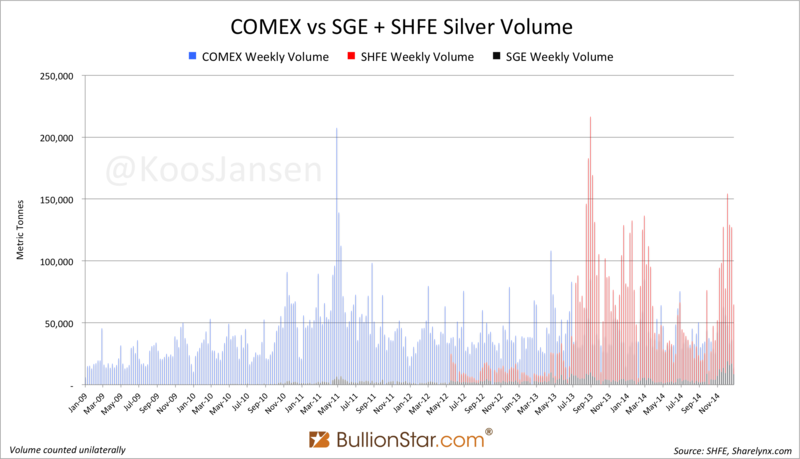 SGE silver volume in 2014 shows less growth relative to gold, probably because silver contracts aren’t allowed to be traded by foreigner investors. 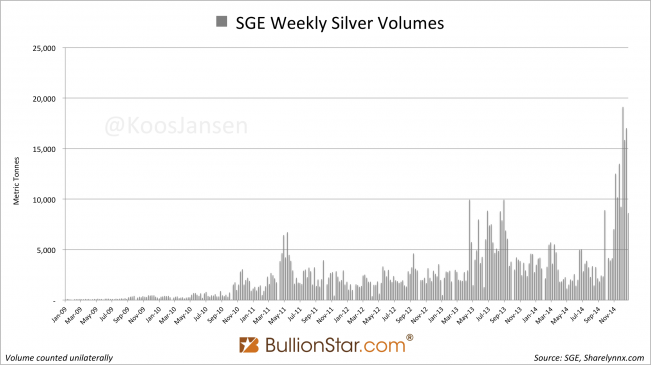 Total silver volume traded on the SGE in 2013 accounted for 215,250 tonnes, in 2014 it was 252,306, so it’s up 17 % y/y. In week 52 SGE silver volume was down 49 % w/w, at 8,602 tonnes. Total silver volume on the COMEX has dropped 2.5 % in 2014 relative to 2013. 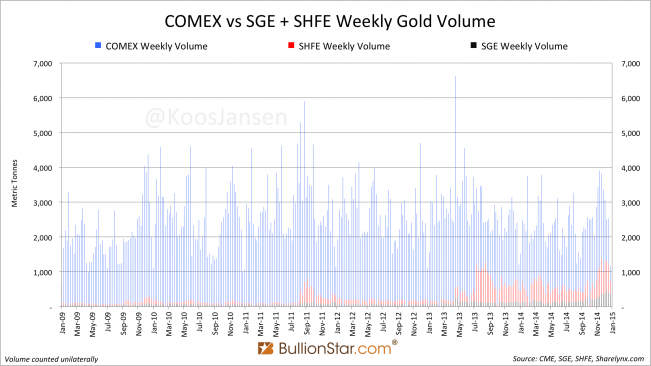 Total volume on the SHFE has increased 14 % compared to 2013. 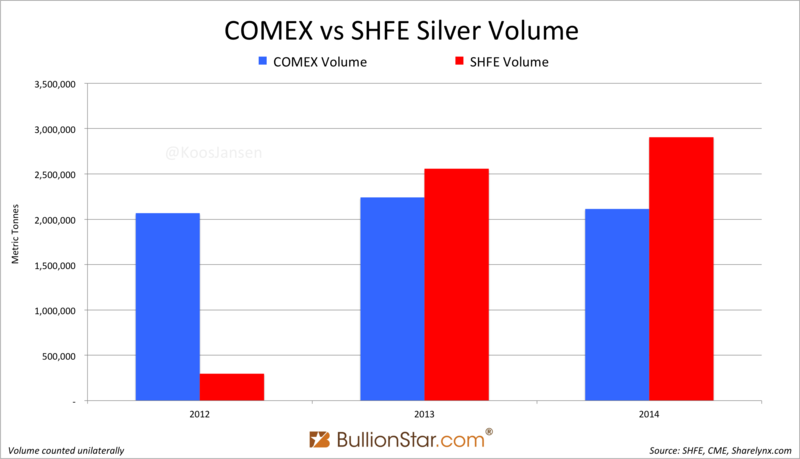 Total volume traded on the COMEX in 2013 was 2,176,519 tonnes; the SHFE traded 2,557,430 tonnes in silver futures, 18 % more. In 2014 the COMEX has traded 2,123,387 tonnes of silver futures, the SHFE 2,908,168 tonnes, 37 % more. The OI on the COMEX closed at December 31, 2014, at 23,264 tonnes, up 27 % y/y. The OI on the SHFE closed at 3,052 tonnes, down 39 % from a year earlier. 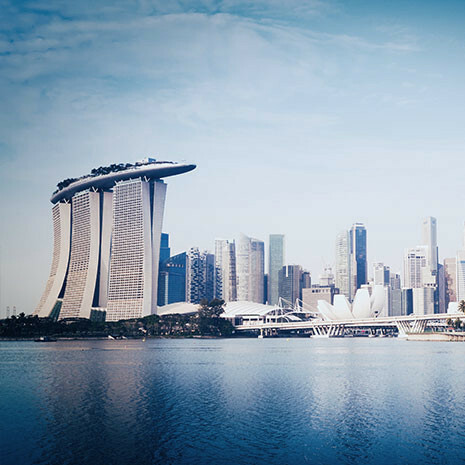 The OI of the deferred SGE contract Ag(T+D) closed on December 31 at 2,471 tonnes, up 25 % y/y. 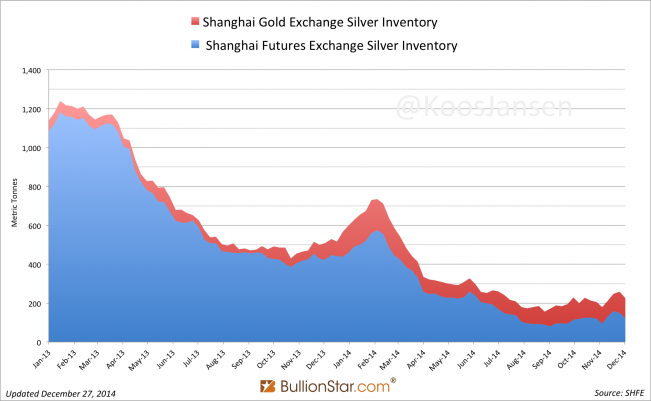 Silver inventory at the SGE dropped 8 % y/y, to 103 tonnes. Silver inventory on the SHFE dropped 71 % y/y, to 123 tonnes. 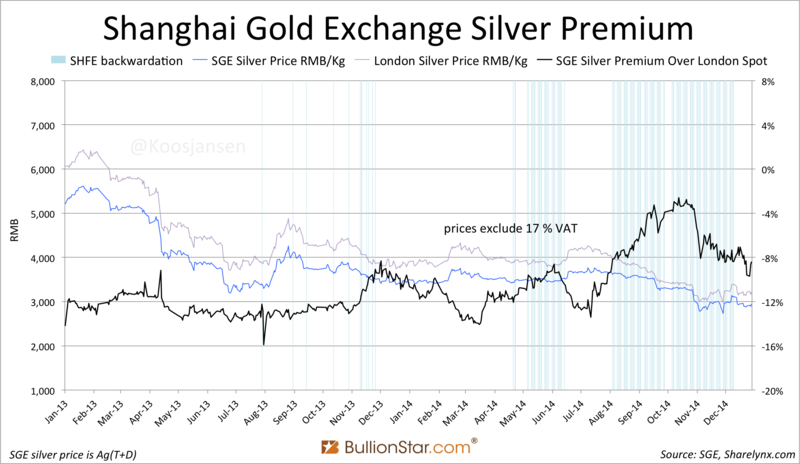 Note, there are many other (spot) silver exchanges in China, these inventories don’t mean that much. 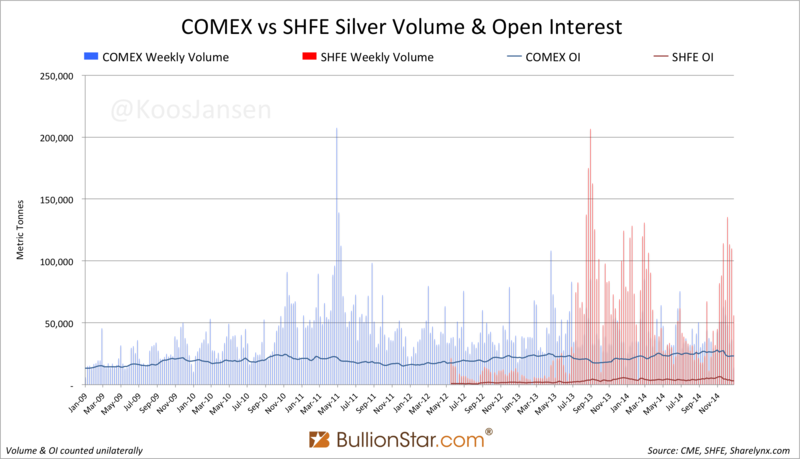 SHFE inventory has been emptied because the cash and carry trade closed (read this post for a simplified explanation) when the silver futures curve on the SHFE went from contango to backwardation. 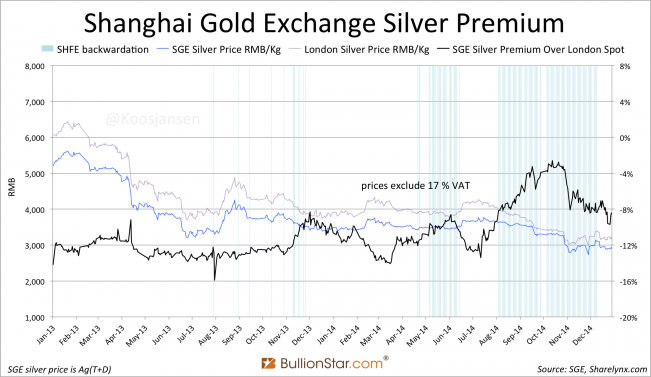 …which caused the discount of silver in the mainland to increase relative to London spot. 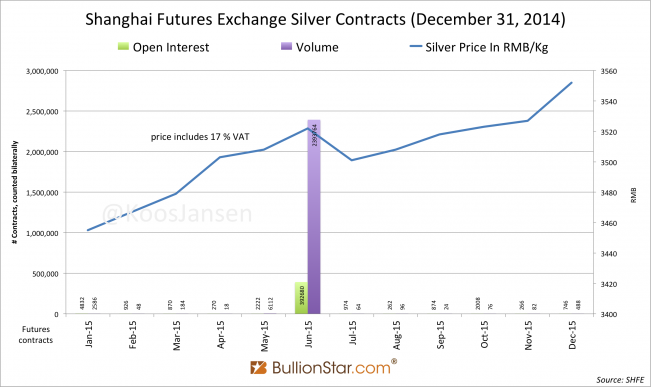 Silver export from China enjoys 17 % VAT, hence the discount is not arbitraged. 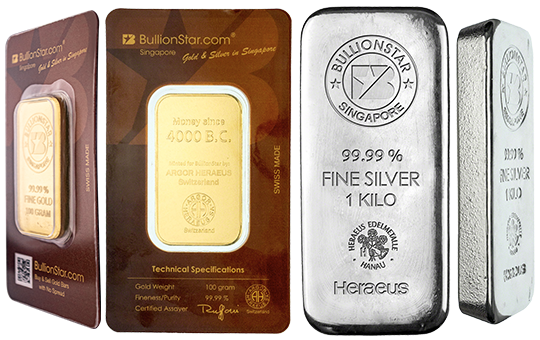 (for more information on the structure of the Chinese silver market read this post).